) (cps are the exclusive representatives for Evapco Air Solutions a/s in the UK northern territories (the north of England and Scotland). 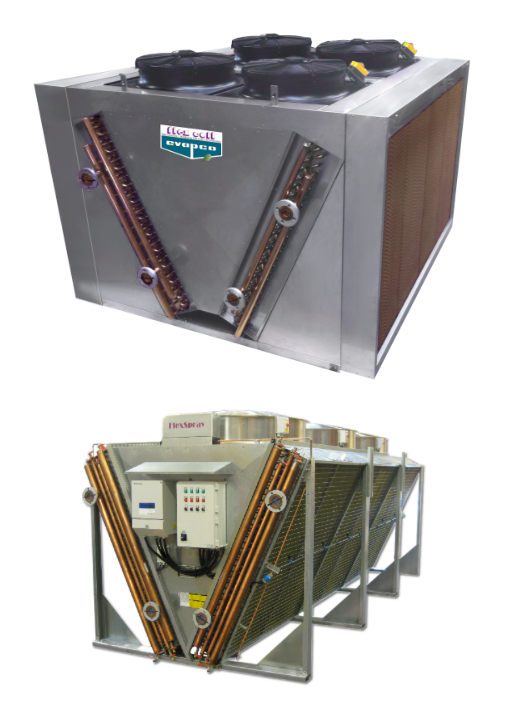 We can offer the complete Flex coil range of cooling equipment, including dry coolers, air cooled condensers, fin & tube heat exchangers, electrical heaters, custom coils & coolers, and control options.
) (cps can provide a solution through correct materials of construction which are tailored to suit the application, whether conventional copper tube aluminium fin, or all stainless steel construction, or even micro bore all aluminium for space saving and the ideal solution to ammonia condensing. 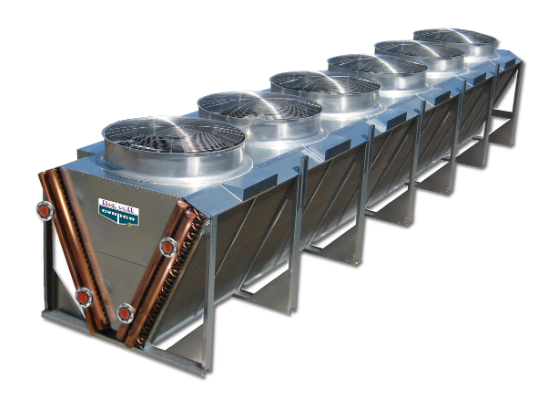 The V Series product line offers an economical approach for Cooler and Condenser applications while allowing personal customization for specific needs. The F-Series product line offers an economical approach for Cooler and Condenser applications while allowing personal customization for specific needs. 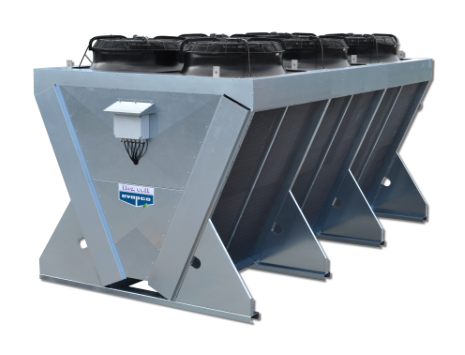 The VF-Series has been developed specifically for projects where the ambient and site conditions are harsh. A wide array of materials and motor choices allow for flexible design options to meet specific requirements. 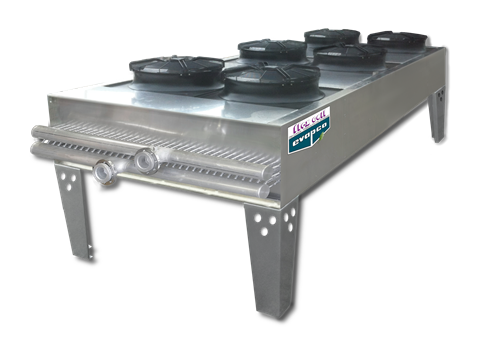 The VF industrial series can be constructed with dual heat exchangers up to 12 meters long and a 2.4 meter width. There is also an option for a 2.2 meter wide version for containerized shipment. Four coil sandwich cooler arrangements are easily selected with coil calc selection software, for HT/LT process cooling applications. Fans and motors are individually selected and sized for optimal efficiency. The FS-Series has been developed specifically for projects where the ambient and site conditions are harsh. A wide array of materials and motor choices allow for flexible design options to meet specific requirements. 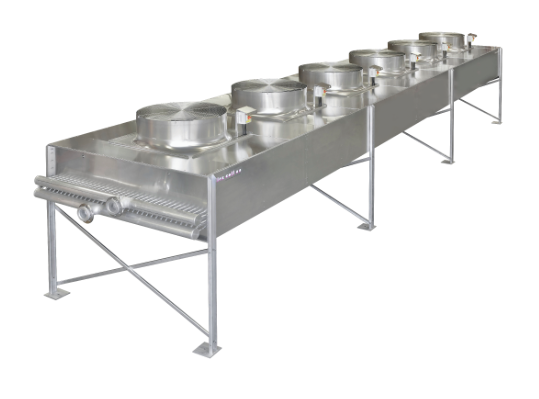 The FS industrial series can be constructed with heat exchangers up to 12 meters long and up to a width of 2.4 meters. The standard 2.2 meter wide version is suitable for containerized shipment. Sandwich cooler arrangements for HT/LT process cooling applications are easily selected with CoilCalc selection software. EAS can fit their dry coolers with adiabatic options, plus electrical controllers. Dry products with adiabatic cooling pads or sprays, are designed to permit the most flexible, economical and hygenically safe cooling system available today. The product allows for cost effective dry cooling during applicable temperatures combined with economic precooling of the entering air to achieve operating temperatures similar to evaporative equipment. The control sequence is designed to enable the unit to adjust accordingly to achieve the lowest energy and water use as ambient conditions change. 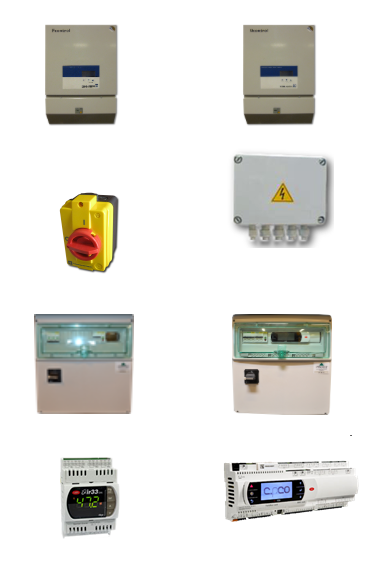 EAS offer a wide range of control option for different setups.